No, I haven't bought any plants yet to go in my raised garden beds. But I will tomorrow! Wait. Let me catch you up. On Thursday I had an entire day off work and I had no appointments, or places to be. 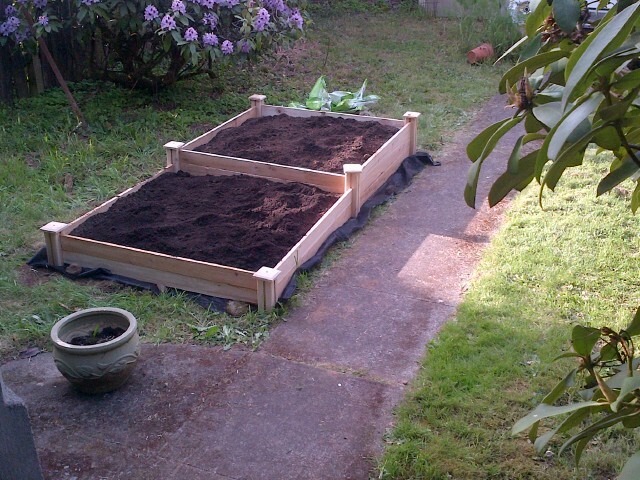 Wednesday night I decided I'd go to the store and buy supplies to make raised garden beds - which I did. I unloaded the supplies from my car at 10 pm, because I am a night person. On Thursday I turned over the soil, put down weed barrier, assembled the raised bed, and put the organic soil into the planting boxes. Voila! Garden space. I also heard about a master gardener sale taking place midday on Saturday, so I will go see what they have and buy some plants to go into the boxes. There's the planting part. Or the literal part, as in talking about real plants. But there is also the writing planting part of my week. I signed up to do the "21 Moments, Part One." This is a program where I receive an email prompt each day for 21 days and I have to write my response. I can write them whenever I want - it doesn't have to be 21 days in a row, though that is what I'm going for. For the most part. So far so good - I've been writing every day. Continuing with the daily writing, from April's A to Z Blogger Challenge, now with the "21 Moments." Planting seeds or moments. To write. I like having time at home, without places I have to be. When I can get enough sleep, and exercise, and do projects. Time without work and without hurry. It's been a good three days. NW Animation Fest this weekend!